Door vinyl graphics are one of the most popular types of custom branded signage. When you want to make a good first impression with your clients, it is important that your door vinyl is consistent with your brand standards and that your business hours, phone number, and other information displayed are accurate and easy to read. Vinyl lettering and logos have an adhesive back and are applied to either the outside (first surface) or inside (second surface) of a glass entrance and/or exit doors. The graphics range from custom computer-cut letters and logos to full color digital prints that cover an entire door. PeopleReady, a TrueBlue Inc. company and a leading provider of specialized workforce solutions, uses a simple one-color vinyl graphic to let customers know their operational hours, address, and phone number. Door vinyl graphics are a simple cost effective way to grab the attention of pedestrians walking past your business. Finance of America Mortgage, a national, full service mortgage banker, uses a three-color computer cut vinyl design to promote their logo and company name on the outside of their entrance doors. They also include a message to those entering the building for after hour appointments. 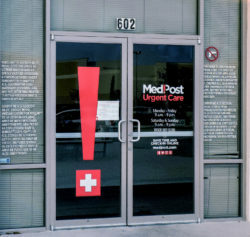 MedPost, an urgent care facility offering walk-in and scheduled medical services, decided to use a snippet of their logo on one of their entrance doors to draw attention and enhance their brand. On the other door, they let customers know their operational hours, website, and phone number. This is a great way to engage your customers at the first point of entry to the business. Door vinyl is a great way to showcase your business and can work in conjunction with window vinyl graphics. Read more on window vinyl here. Think door vinyl graphics are a good fit for your company or simply have questions about them? Don’t hesitate to contact us to start a conversation about door vinyl graphics or check out more signs in our Egan Sign Gallery. Egan Sign. Sign Management Made Simple. Follow Egan Sign on Facebook, Twitter and LinkedIn for updates on the company and what’s new in the sign industry!